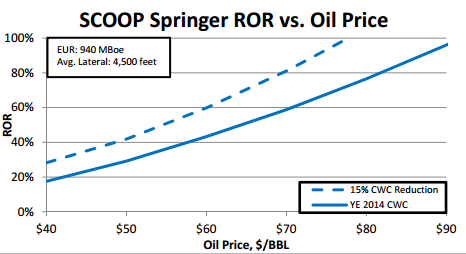 What's the marginal cost of oil supply - $60/bbl or $80/bbl? Much has been written lately about the falling marginal cost of crude supply, as breakeven costs for US shale continue to fall. 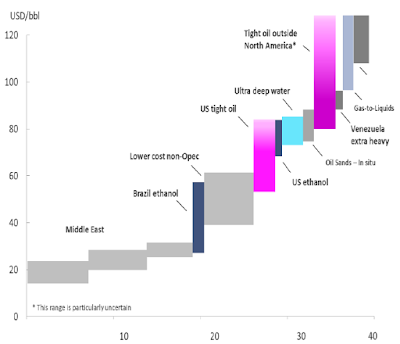 Last week, Goldman Sachs cut its Brent oil price forecast to $65/bbl in 2016-18 and to just $55/bbl in 2020, well below consensus and the long-term forward curve. The bank argues that US shale breakeven costs have dropped by $20/bbl in a year thanks to structural efficiencies and productivity improvements. The global oil curve has become flatter and lower, and growth from US shale and OPEC is enough to meet demand growth to 2025, the bank argues. 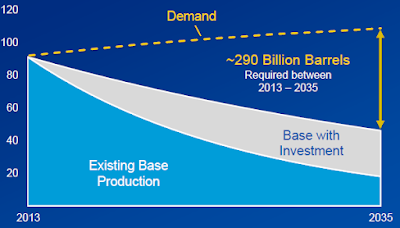 We have a lot of sympathy for GS's argument that US shale has fundamentally reshaped the global oil cost curve. It is now widely accepted that US light tight oil economics are generally more robust than many other sources of non-OPEC incremental supply, notably (ultra) deepwater and oil sands. Deepwater and oil sands have thus been duly pushed to the right of the cost curve and a myriad of deepwater and oil sands projects have been delayed. 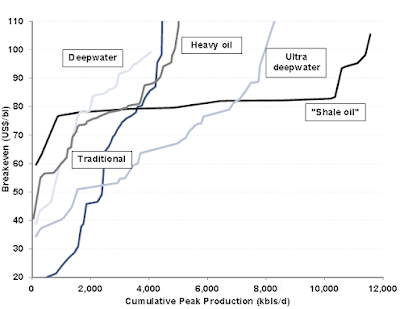 Shale breakevens in the top basins (Bakken, Eagle Ford and Permian) are well below the $80-100/bbl often required on deepwater, oil sands or enhanced recovery projects. To quote a few examples, Bakken producer Continental Resources expects average IRRs of 40% at $60/bbl assuming a 15% reduction in costs. 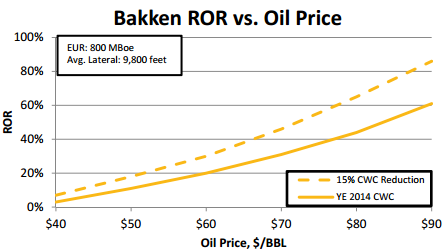 If we assume a more reasonable minimum target return of 20%, Continental's oil price breakevens range from $50-60/bbl in the Bakken down to $30-40/bbl in the more profitable SCOOP (Oklahoma Woodford) shale. (These are quoted in local oil prices, which trade at a discount to Brent). Permian producer Concho Resources sees 50-60% IRRs at $60/bbl in the Permian basin with enhanced completions, implying low breakevens well below $50/bbl for a target 20% IRR. One important caveat is that shale break-evens are highly variable by play and county. 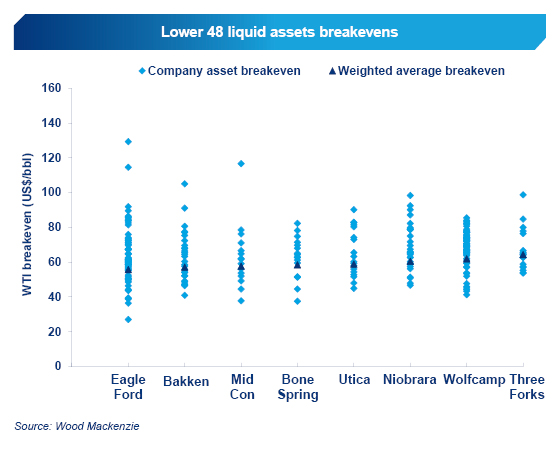 The chart below from Wood MacKenzie shows significant variability in liquids-rich shale breakevens, ranging from $30/bbl to $130/bbl in the Eagle Ford. North Dakota’s Department of Mineral Resources estimates break-evens in core Bakken counties at just $29-41/bbl, compared to $44-75/bbl in non-core areas. Meanwhile, typical deepwater projects (if there is such a thing as a “typical” deepwater project) such as those in the US Gulf of Mexico or West Africa require around $80-90/bbl in a 2014 cost environment, and costs aren't coming down particularly fast. Lower service costs and smart re-engineering in the pre-FID phase could theoretically decrease these break-evens by, say, $10-15/bbl to a more palatable range of $65-80/bbl. Majors have asked for significant price reductions (20-30%) from their suppliers; but while drilling day-rates and seismic costs have fallen substantially (35-50%), subsea and platform construction costs have yet to come down materially. One exception is the Brazil pre-salt, with all-in supply costs of $40-45/bbl according to Petrobras, although this guidance is before cost overruns and delays. If low-cost shale and OPEC can indeed meet all of the world's needs - and this is a big if, it begs the question of whether the world still needs expensive projects. In a world with no natural depletion and no demand growth, expensive projects such as oil sands and ultra-deepwater should simply not be needed, and the shale revolution would push down the long-term oil price to the $55-65/bbl level that GS has talked about. However, the reality is that the industry needs to put onstream c 4mb/d of new production just to stand still given natural decline rates and c 1.1mmb/d of annual world demand growth. 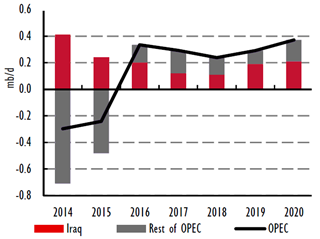 We are doubtful that OPEC and even a buoyant US shale industry can together produce 4mb/d of liquids growth per annum. 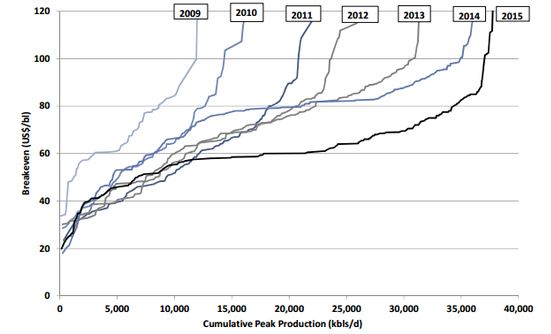 The charts below illustrate the enormity of the task at hand for the global oil industry. More than half the world’s oil is produced from fields already in decline, where underlying decline rates are typically 10-15% (ex-reinvestment) and probably closer to 4-6% post-reinvestment. 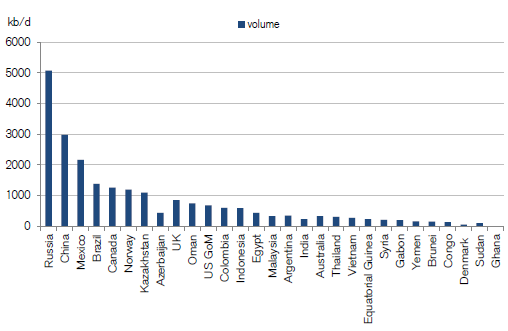 As Exhibits 7-8 shows, most of the non-OPEC world’s mature or “legacy” production in terms of size is in Russia, China, Mexico, Brazil, Canada, the North Sea and central Asia, where decline rates range from 6% for the big onshore producing countries up to 15% at the top end for offshore and deepwater. In conclusion, North American shale alone is unlikely to have shifted the entire global cost curve much below $80/bbl in the long run. Time will tell whether Goldman - which famously called for $200/bbl oil in the 1H 2008 bull run - or us will be proven right. Cairn's Capital Markets Day this month focused on Senegal, providing some insight into its 2014 back to back independent discovery wells, FAN-1 and SNE-1. Here we look at the shelf edge discovery SNE-1 and point to the key uncertainties the company will need to address when it returns to drilling in the region at the end of 2015. Cairn was very enthusiastic about its SNE-1 discovery when it reported initial results back in November 2014, so it is no surprise that it is focusing on appraising here now. The discovery well was drilled on the shelf edge in 1,100m of water and encountered 32° API oil in 30m of net oil bearing reservoir in a gross reservoir interval of around 100m in the target Albian sandstone. Data recovered from the well is very positive. Reservoir quality was described as excellent at the time of discovery and we now know that the average hydrocarbon saturation is over 70% and average porosity is 24%. while pressure measurements and fluid samples collected as part of the logging programme show good mobility from all the reservoir intervals. To follow up on these promising results, Cairn will return in Q4 2015 with a firm three well campaign consisting of two SEN appraisal wells and and exploration well on a shelf edge prospect. Cairn estimates unrisked 2C resources of 330mmbbls with a 1C to 3C range of 150 - 670mmbbls. A key risk on volumetrics is commonly driven by uncertainty in OWC. Pressure data from the well has however provided a textbook pressure profile with clearly defined Gas Oil Contact (GOC) and Oil Water Contact (OWC) so that volumetric uncertainty comes from elsewhere in this case. The answer lies in the complex geology that overlies the 60 -100km2 field and complicates the seismic time to depth conversion, giving varied results. Getting to grips with this will be key, so drilling the two appraisal wells planned for SNE should allow de-risking by providing extra data points for seismic calibration. In addition to reducing the resource uncertainty range, the appraisal programme will focus on establishing the reservoir continuity and connectivity. Nothing from the seismic suggests this will be an issue, but understanding this will be crucial to determining field commerciality. In SNE the plan is to assess this through interference testing sometime in 2016. Requiring a minimum of two wells, this involves monitoring a pressure response in one well to a transient change in another. Finally, the sand distribution in the reservoir will be something to pay attention to in the appraisal wells. Within the 30m of net pay found in SNE-1, we know that this is not one thick sand, but made up of a number of sands of varying thicknesses, from the order of tens of metres down to less than a metre. Thinner sands could prove more challenging to produce and effectively drain, so the prevalence of these will likely impact recovery from the reservoir.